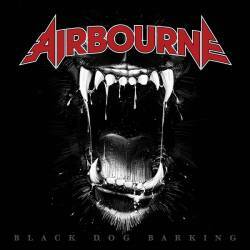 Airbourne have unveiled the artwork for their upcoming third album, ‘Black Dog Barking’, due for release on May 21st through Roadrunner Records. Produced by award-winning Brian Howes, ‘Black Dog Barking’ is the follow-up to 2010’s successful ‘No Guts. No Glory’. Hailing from Warrnambool, a small drinking town on the southwestern coast of Victoria, Australia, Airbourne — vocalist/lead guitarist Joel O’Keeffe, drummer Ryan O’Keeffe, guitarist David Roads, and bassist Justin Street — has gained an immense following with their explosive live shows and main stage festival appearances including a headliner spot at Wacken 2011, Rock Am Ring/Park (Germany) and Download (UK).